The following is the first in a series of posts about our recent trip to Rome. One can’t visit Rome at this time of year without being overwhelmed by the presence of artichokes. 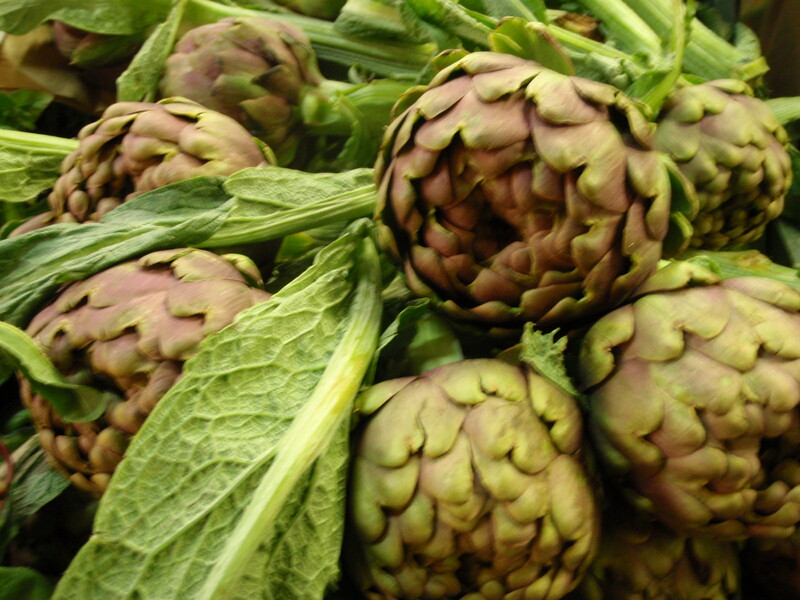 Artichokes are everywhere: at the market and in all courses of an Italian menu except dessert! In a cuisine still largely seasonal, the artichoke is the harbinger of spring, and the special Roman variety grown near Rome is king. 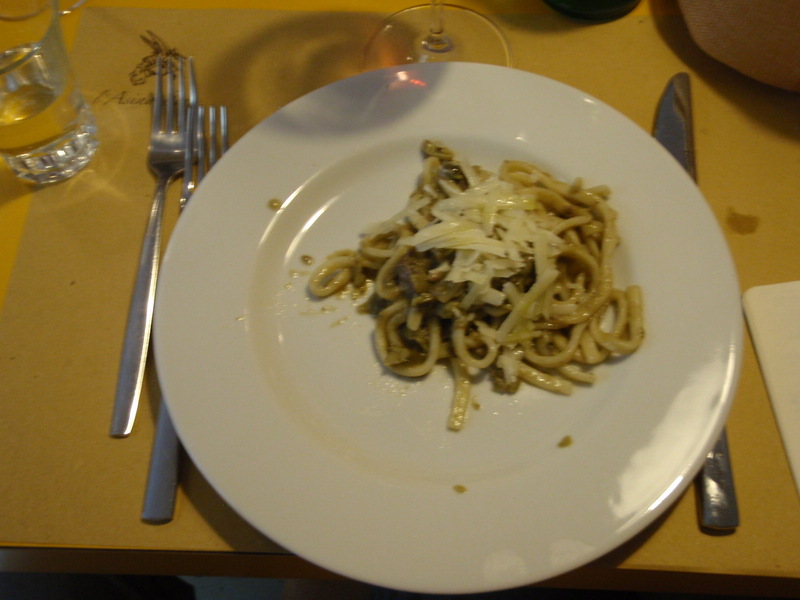 The two most typical preparations in Rome are carciofi alla giudia (Jewish Style) and carciofi alla Romana (Roman Style). Carciofi alla giudia are whole, fried artichokes. They are “Jewish” because the preparation developed in the Jewish Ghetto in Rome, the district where Jews were forced to live under Papal decree from 1555 until the Papacy lost power in Rome in 1870. Despite, or perhaps because of, this injustice, the traditional cooking of Rome’s Jewish population is one of the city’s culinary gems. Carciofi alla giudia are whole, trimmed artichokes fried in a large quantity of olive oil. The resulting artichoke has lovely, crisp leaves, and a moist, delicate inner core. The leaves are slightly spread out, which makes the artichoke look a little like a sunflower. Carciofi alla Romana are whole, trimmed artichokes braised with garlic, parsley, and mint. In Italy, one can braise a whole artichoke because they are harvested whenmuch younger than the American version, which is almost always allowed to develop a bushy “choke” right in the center of the artichoke which must be removed. In addition to the two classic preparations, on our recent trip we experienced artichokes on pizzas, in a pasta sauce with lamb, and (our favorite) sliced into little slivers, dusted in flour and fried. We could have ordered artichokes every day and not been bored. Shopping for artichokes can also be fun, as the most skilled vendors will sit next to their produce, steadily trimming the vegetable for those who can’t be bothered to take the trouble at home and want “fast food”. While we were shopping for a cooking class one day, one vendor struck up a conversation with one of my companions and ended up posing for a photo with her, the sort of exchange pretty frequent in Italy but almost unheard of here in the States. To some, artichokes are an acquired taste. They certainly offer an understated and subtle expression of flavor. But this, perhaps, is their charm. With careful seasoning, however, which is more difficult with this vegetable than with almost any other, artichokes offer a unique and delightful contribution to the table, and they do it better in Rome, perhaps, than any other place on earth.